Melissa Stern in the studio. 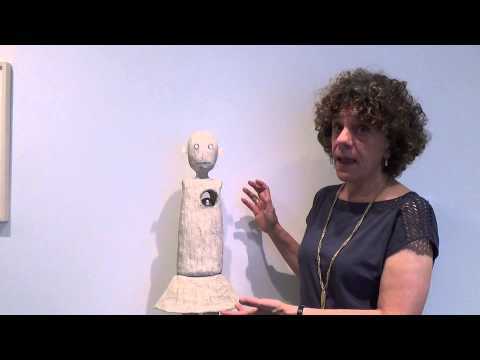 The focus of artist Melissa Stern’s project, The Talking Cure, is a group of twelve sculptures made of clay, wood, found objects and other materials. The simplified human figures suggest individual, ambiguous personalities. Stern invited 12 writers to interpret each work, and the resulting interior monologues of the sculpted characters were then reinterpreted and read aloud by recorded voice actors. Visitors to the exhibition can read or listen to these examples within the gallery, and are strongly encouraged to create new narratives of their own. Also on view are drawings by the artist that address wider questions of psychology and its relationship to art and story-telling. “The talking cure” refers to Sigmund Freud’s original description of his psychoanalytic method, in which he encouraged his patients to talk through their symptoms and thoughts in order to reveal their subconscious feelings.